The evangelical church needs to get a grip. There's something about a national election that brings out our worst instincts. This cycle's version features apparently serious discussion by some Christians in support of these ridiculous secession petitions. One word: STOP. So we're trying to secede from a land where we're already strangers and exiles? Why? Because we've gone native--we seem to think we belong here. Over the past several centuries, people have mistakenly linked democracy and political freedom to Christianity. That's why many contemporary evangelicals believe the American Revolution was completely justified, both politically and scripturally. They follow the arguments of the Declaration of Independence, which declares that life, liberty, and the pursuit of happiness are divinely endowed rights. Therefore those believers say such rights are part of a Christian worldview, worth attaining and defending at all cost including military insurrection at times. But such a position is contrary to the clear teachings and commands of Romans 13:1-7. So the United States was actually born out of a violation of New Testament principles, and any blessings God has bestowed on America have come in spite of that disobedience by the Founding Fathers. This assertion seldom meets with easy acceptance in the American church, and frequently leads to the indignant objection: "Do you mean we should always submit to persecution?" That's an interesting discussion, but a largely academic one, unless you live in Iran, China, or Saudi Arabia. So let's take a deep breath and get back to 21st century American reality: we're just no where near that point. Not even remotely. Let's be frank: we American Christians are pampered. We don't merely desire godly governance, we insist on it as our birthright. When we don't get it we are scandalized. But the Apostles Peter and Paul were writing to churches familiar with persecution on quite another scale. To these authorities they were commanded to submit and pay respect. So how did things suddenly get so bad that serious Christians are joining in the secession chatter in 21st century America? 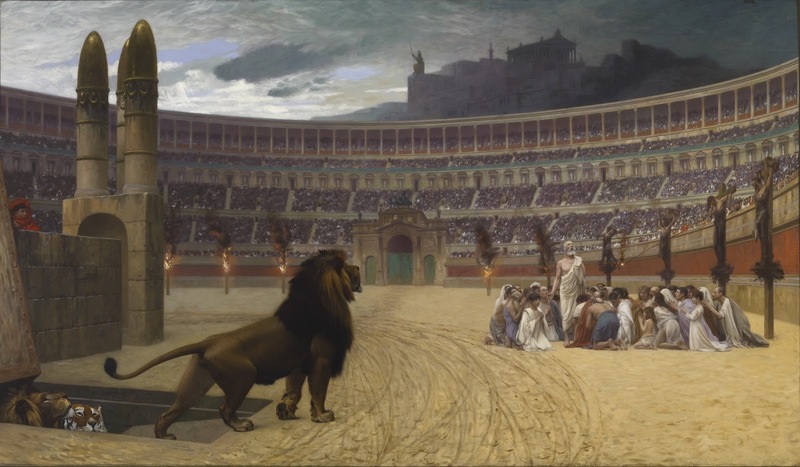 Someone in your church been fed to lions recently? Our freedom to worship in this country is something of an historical anomaly and a tremendous blessing. But blessings can be squandered, which is what happens when the church gets wrapped up in election results and neglects our first duty: being salt and light in a lost and dying world. Where certainly we may worship as we chose, we are nonetheless forced to finance the slaughter of the only innocents. Tell me again of the worldly desires of those wishing to break away from what they perceive is a sinful government to which they feel to have no recourse. Were a minority of those within the nation embracing virtuous sanctity, they would be rapidly outvoted and forced to engage in commerce of debauchery. Akin's words were far from eloquent, but explain the logic to me of killing a child who is without sin in vengeance for a crime. It is certainly true that, on the basis of any decent theory of government in this age, an unborn child has done nothing worthy of a death penalty. That he is "without sin" is controverted in so many places in Scripture (e.g., Psalm 51, Romans 5) that it really can't be allowed to pass without remark here. Still, that killing him - or letting him die, should he manage to survive the abortionist's first efforts, a practice to which our current president is explicitly committed - is an act of egregious injustice and ought to be resisted in some way is a point well made. Not only has the gov't forced citizens to pay for the slaughter of the unborn, but they have caused the majority of welfare recipients to stay dependent on the gov't and tax payers money. The Bible says you don't work you don't eat. The gov't is $16 TRILLION in debt, we are fighting many wars (most unconstitutional) and nation building. We are overthrowing dictators and letting mob rule come on from the Muslim brotherhood and instituting Sharia law. We are secretively drone attacking countries. I could go on about MANY other problems with the federal gov't and the fact that states are considering withdrawing from the union. Not only do they (*most states at least) have the right to secede, but I support their desire considering our gov't is in direct opposition to almost ALL Biblical principals. In all honesty I would advise anyone that would label this as "temper tantrum" to reconsider their convictions and what they stand for. Now I fully realize that the job of the church NEVER changes. Have a relationship with God, spread the gospel, make disciples, etc. BUT we are still a part of this country and if Texas no longer wants to be a part of the union to say they are "throwing a temper tantrum" as is anyone that supports them is sad. What is it going to take...a country with gov't similar to Nazi Germany before you say, 'okay you know what perhaps we should not support the gov't any longer and begin thinking about secession.'. Let us all get real about the situation...if you know anythign about economics you fully realize a collapse of our house of cards economy is inevitable. I look forward to it though, b/c it will take all the materialistic distractions from people in this country and perhaps that is the only way that we will have revival!! This was an excellent article. I don't like who we elected, but I didn't like his main opponent either. However, this is the government we have and God never asked me how to improve it, so I guess He knows what He is doing. Rebelling never seems to gain much in the Bible either, thinking about how Israel seceded from Judah. First: "Be subject to the governing authorities." (Paul) or "Submit yourselves for the Lord's sake to every human authority". (Peter) Are these incompatible with submitting a petition on the White House "We the People" website? Second: "Give everyone what you owe them: .... If respect, then respect. If honor, then honor" (Paul) "Show proper respect to everyone. .... honor the emperor." (Peter) Now things get harder: If a "We the People" petition tends to embarrass the current administration, is it wrong to encourage it for that very reason? At the beginning of 1 Timothy 2, we're told to pray for "kings and all who are in high positions, that we may lead a peaceful and quiet life, godly and dignified in every way", and then he gives a reason, "This is good and pleases God our Savior, who desires all people to be saved and to come to the knowledge of the truth". Is it reasonable to conclude from that that God wants us to encourage good government for the sake of the gospel? Is it reasonable to also conclude that there is a place in that for discouraging bad government? If so, how far may a believer go? Is he NEVER to mock behavior by the magistrate that he believes does not tend to "punish those who do wrong and ... commend those who do right" (Peter)? If so, may he never so much as post a comment on Facebook, asking, ".... What happened in Benghazi?"? If we don't want to go that far, how far do we go? Finally: It's all very well to recognize that the third paragraph of the Declaration of Independence is nowhere found in Scripture; and that it's nowhere stated in Scripture that the very brevity of the Constitution, taken together with the 9th and 10th Amendments (in effect, "thus far, and no farther") gives us principles of limited government that a Christian OUGHT to defend. But are we to conclude from that that it is WRONG for a believer to defend them? If not, could it be that there's more than one way to give in to a "temper tantrum" on this whole subject? Applying Romans 13 to contemporary politics is always a delicate business, and for a warning on how delicate it can be, I recommend Macaulay's treatment on the stances taken on both sides after the "Glorious Revolution", mocking the one side ("non-jurors") as being seemingly willing to tolerate the worst monsters who grabbed the purple for a season in the 3rd century - and condemning anyone who resisted them - and then mocking the other side as being seemingly willing to accept their overthrow and justify that from Scripture with pretty tortured arguments. Postscript: Wanting to be sure to offend as many as possible, I'll invite everyone to join me in burning a South Carolina flag this coming December 20, the 152nd anniversary of their secession from the Union, and my candidate for an appropriate "Libertarian Day of Mourning", consecrated to the principle that pretty much any secular precept (such as limited government) can be shipwrecked by those who use it to defend the indefensible. I'll use "reply" for a Post-Postscript: We attended a meeting recently having to do with the Freedom Rides where one of the speakers echoed what seems to be both a Christian and Jewish conviction that "justice" is inseparable from who the True God is. Indeed, at the end of Romans 3, Paul talks of "Christ Jesus, whom God put forward as a propitiation by His blood ... so that He might be just and the justifier of the one who has faith in Jesus". So, if believers aren't passionately concerned about justice, it would be hard for them to do a very good job of explaining why it's so important to God, and proclaim a gospel that reconciles the seeming contradictions involving a God who is just and "who justifies the ungodly" (beginning of Romans 4). So that the church has a proper "prophetic" role in relation to the magistrate doesn't seem too much of a stretch, nor that individual believers may share in that role. With that said, I have to point out that the speakers at that meeting were not content with applying their principles of God and justice to the old "Jim Crow" system (or to the slavery which preceded it) but were eager to apply it today to campaigns for abortion rights, homosexual "marriage", strengthening public sector unions, and on, and on. So, once one signs up to do "the Lord's work" in this age, there is often no limit to the outrages one might support "in His name". It could be argued, of course, that these speakers were "religious liberals", and so they were, but let's remember that it was, in general, very "conservative" believers who (also seeing themselves as heirs of the anti-slavery movement) gave us the 18th Amendment, and so, arguably, did much to firmly establish organized crime in our midst. Things are getting a bit conflated here. On one hand, there is an excellent discussion to be had on "The Limits of Civil Disobedience", which as I recall was the topic of a very interesting essay on the Bible's teaching on the matter by one Presbyter (when the issue came up in our church in around 1986). I elected not to go into that, but it is certainly a topic worth exploring at some length. No, my particular concern is that secession is really not civil disobedience in the category of the 1961 Freedom Rides. The latter said, "I believe the authority is wrong and I'm willing to pay the penalty for saying so in peaceful ways the authority doesn't like." The former says, "I reject the authority, and refuse to be subject to it any longer." For the church to be a visible part of such activity is, in my view, unbiblical. Finally, one can say, "Well, it's just a petition. Nobody really takes it very seriously." I'm sure this is true for most, which is why I refer to it as a "temper tantrum". Unfortunately from what I've seen a fair number of people take it very seriously, for there is a non-negligible part of the visible church which pines quite vocally for a temporal New Jerusalem. We ought not encourage them in my view, as it is not a productive use of their time & energy. In Christopher Hill’s history of 17th century England, he reports that one device the Stuart kings employed was to present themselves as the defenders of common people against exploitation by what we might call “intermediate powers and institutions”. The crisis of the century came when, along with reaction against religious matters associated with Charles I, those powers and institutions reacted against Charles’ attempts to rule without them. When the consequences (including Charles’ execution) of that frightened them, they recalled his son, Charles II. When his successor, James II proceeded to reopen all the old religious and political issues, the result was the “Glorious Revolution” of 1689, and a system of government characterized by both a strong executive and substantial intermediate institutions followed, which still persists in some degree today. Even in England, which for decades after the 17th century retained an established church, this system, strong enough to maintain order, yet tolerant of “civil society” and religious dissent, made it possible for Christianity, both inside and outside the established church, to flourish for decades, and to do so in ways that both advanced the gospel and benefitted the secular realm in which it operated: Bunyan, who began “Pilgrim’s Progress” in prison as a religious dissenter under Charles II, was able to publish it, despite much in it that must have revolted the Stuarts, even before the Glorious Revolution. The Great Awakening of the following century involved both England and its American colonies, with prominent figures like George Whitefield, an Anglican preacher, and Jonathan Edwards, an American Congregationalist. During the early part of the 19th century, British evangelicals continued to evangelize and to exert a positive influence against slavery, with prominent figures like the Wesleys, dissenting Methodists, and Wilberforce, an evangelical Anglican. However, while American Christians have supported the American Experiment, by and large, that support has not been universal even among us, and it has certainly not been universal in the nation at large: The notion of the Stuart kings that only their vigorous rule could suffice to protect “the little people” from powers and institutions below the kings’ level, but above that of “the common man” is very recognizable in the “Julia” advertisement used by President Obama during the recent presidential campaign. In the scheme implicit there, we find the individual, protected by the government, and with her needs provided by it, with no mention of any mediating institutions, not even family! And this scheme is not a recent development, it’s roots being at least a century deep, going back to “the progressive era”. Are our founding documents brief? Well, they’re “alive”, with a “meaning for today” that grows, and grows, and grows. Is there still room in between “Julia” and government for much else? Well, in California, if your child tells you he has homosexual longings, it’s now illegal for you to seek professional help with that. Does your church oppose abortion? Well, under the Affordable Care Act (about 235,000 substantive words, by the way), if you provide health insurance for your employees, that insurance must cover abortions. In this respect too (religion) we see the suspicion of the Stuart kings coming back to life, as centralized government still tends to hate any form of religious expression which it doesn’t control. What should the attitude of American Christians be toward these developments? Should we compare the American Church with that in China (which is quite vibrant!) and shrug our shoulders, saying that persecution will probably be good for us? Or, despite all of our shallowness and self-indulgence, should we pray that the Lord will preserve the “space” He has given us in this system, and, at the same time, pray that He will send His Spirit to revive us? And, if our course is the latter one, what sort of actions would be proper for us in the matter of preserving our “religious freedom” here? With that, we come back to “practical politics”: As I stated above, the “Progressive Project” has been going on for at least a century, and a good case can be made that now, in 2012, it has left us with two political parties, a “Radical Progressive Party” (RPP) and a “Moderate Progressive Party” (MPP). Each pursues the Project, the one impulsively, the other with more deliberation. Neither has any interest in undoing the damage the Project has done. Can anything be done to change that? One possibility that suggests itself arises from the question, “Can you conceive of any way that the MPP can, in the foreseeable future, ever win another presidential election without carrying Texas?” (If you can, be sure to tell us!) If then, a pro-independence party could establish itself in Texas, and threaten to gather a substantial percentage of its vote, what would be the effect on the MPP? It’s hard to say, but it might be salutary. Tweedledee (or Tweedledum, depending on your taste) might suddenly discover “a new birth of Jeffersonian idealism” to go along with his greed and hunger for power, and some of the “space” in our system that has been closing up might begin to open up again. It’s possible. I don’t see mooting the notion it as being a “tantrum”. David is a good example of submitting to an ungodly authority. The very jealous King Saul was out to kill the very popular David, and David could easily have killed him and seized the government but he didn't, choosing instead to honor the King and wait for God to accomplish His purposes. I agree with you that much of what passes for evangelical Christianity is merely religious patriotism. But must we accept John MacArthur's assertion that the American Revolution was sinful? What is his rationale for this? Does one government not have the biblical right to wage war against another? The American Revolution was NOT a "mob" reaction of lots of individuals deciding to rebel against England; it was the colonial government that was established by the King of England.About 30% of the colonial citizens wanted war. How does this violate New Testament - or overall Biblical - principals? Stuart -- I'm not altogether comfortable evaluating the activities of governments (even colonial ones) in the same way I evaluate those of the church, so in that sense I take your point. However, what I see underlying much of the "religious patriotism" you refer to is the tendency to overcelebrate the participants in the American Revolution as somehow divinely inspired holy warriors. So I think it's worth goring a few oxen in order to shake up our thinking and make us remember why the church is here. My point was to do just that in questioning Mac's assertion about the American Revolution. God endorsed secession in 1 Kings 11-12. The secessionists were the godly ones. Judah was able to remain free for over 100 years longer than the northern kingdom because Judah separated itself from Israel. This was a peaceful secession, and anyone signing a petition to secede today is asking for the same thing. If the national government granted the petition, the secession would not be a rebellion against the governing authority. Secession by violence is another matter. We are not there yet, whatever the criteria might be. The secession in these chapters is Israel from Judah, not the other way around. God used it to punish Solomon's sin through Rehoboam's arrogance. Had Jeroboam not acted in unbelief, refusing to let his people worship in Jerusalem, we might have had a lesson on secession here, but, as it is, what we have is a lesson on "the sin of Jeroboam" (over, and over, and over). I think it's dangerous to make very much of this on the subject of secession. See just above: I put the reply in the wrong place. This is a very interesting topic and has given me pause to think. I am on board with the sovereignty of God but I struggle a bit with the notion of supporting a government that supports the murder of so many children with my tax dollars through abortion and the slaughter of so many innocent people in the name of regime change around the world. Jesus was correct in saying that His kingdom was not of this world and that we need to set our eyes on the Kingdom that will follow when He returns to establish it. He was also right when He said, "when you pray....pray like this, Our Father who art in heaven....Thy Kingdom come, Thy will be done on earth as it is in heaven..."
In all things I ask God to help me understand His ways more and put aside my ways. Prayer helps me to accept what comes because I understand he is King! I do enjoy reading your posts; it's good to see an American who is able ask questions about his country whilst serving it. Over the last few months I have read a lot of posts about your recent presidential election. Some of them were barely disguised campagining, some were almost unintelligable to one who did not grow up in the US but, sadly, very few showed much Christian compassion to those whose policies they disapproved of. You, like us here in the UK, do have a strong Christian heritage but that does not make either country Christian; people are Christians, not nations. I understand some two thirds of the signatories to the declaration of independance were practising freemasons. This is a cruel & slightly twisted question but with that demographic in place, would it not be democratically accurate to describe the US as a masonic, rather than Christian, nation? I don't know the reasons your founding fathers fled the UK but it does seem, from the Jailer's post, that the secessionist attitude they took with them, remains a strong one in your nation. Fleeing does not stop a problem, it just puts it further away from where you are. You, like us, need as many fervent commited Christians as you can grow in your society now. I really do hope & pray that, as a nation, you can find your past the stumbling blocks before you, until you become great because of character & not might; you could pray the same prayer for us too. Jailer, thanks for the response & the posting, most kind. I've read your blog & you have some interesting comments there. We Christians haven't had the ear of government here since the end of WW2 when a very unofficial grouping known as the Non-Conformist Conscience faded out of view; it was middle class business owners & professionals within that branch of the Church who had such economic clout that between WW1 & WW2 their acceptance of government policy was considered vital to its success. Funnily enough there have, over the last few years been a number of Christian projects, in conjunction with the secular authorities, have been an amazing success; one such is Ipswich Town Pastors. I know about this one because I was involved in it. I found the comments about 'religious patriotism' intriguing &, from my transatlantic pov, it does sum up your situation quite well. It's always worrying when a nation, any nation, sees itself as God's right hand. You're right of course about the Church being more than another demographic box to be ticked. Several times, Church leaders here have commented on government policy only to be instantly labelled as an enemy of the government, the Prime Minister & his dog. The media have a very limited understanding of what the church is about & I find the idea Christians have to be forced into agreeing with everyone else more than a little annoying. Keep blogging, mate! Presbyter, you are so right in what you say. Personal holiness is so much more important than subscribing to political doctrine. It is the great tragedy of our time that Christians have forgotten, by & large, how to be Christians. It is how we live our lives that really makes the difference noticeable & relevant. One by one, He can change the world! Thanks for the kind words, Graham. I think there is an understandable level of concern among Christians about the direction of the country's values (both here and in the UK), but as you can tell I have concerns that Christians on all sides of the political spectrum are quick to look for political solutions to unbiblical societal attitudes and beliefs. A previous comment pointed the finger at "religious patriotism", which I thought was an apt turn of phrase. Ultimately winning our respective countries to follow Christian policies must be prompted by cultural acceptance of those policies, which must in turn be prompted by spiritual renewal. That begins with the church acting like the church, not just another political interest group to be dragged to the polls. Cut from the same cloth, pre-washed, pre-shrunk, predestined! :-) I will share this after the turkey fat has receded and people are able to switch their thoughts from their bellies to their heads again. Then again, it's not in the power of the flesh (whether fat or famined) that anyone really understands anything at all. Blessings! Thanking God for you today! We all know folks who live up to the ideal expressed as: "You just can't be nice to some people." I'd respectfully submit that the church sometimes exemplifies that sentiment. When things are going well, we get lazy, fat and self-satisfied. Jesus commanded His disciples to go into Jerusalem, Judea, Samaria and the uttermost parts of the earth ... but it wasn't until persecution hit that the church began to move out. Somehow the church in the USA is supposed to be different? Has anyone read the back of the book? Things are going to get ugly ... "with a capital ug"! Don't get me wrong. I like "the good/easy life" as much as anyone, but such a life rarely makes me more like Jesus. Looking back at the real times of growth in my life, I discover that they are largely those times of struggle. I suspect that such shall it ever be "until Shiloh comes." A Very Air Force Thanksgiving in New York City!